John Travolta has never been afraid of reaching new heights. The actor soared to fame with his performances in iconic movies like Saturday Night Fever, Grease, and the cult-classic Pulp Fiction. But, the actor is also known for being a skilled pilot — getting his license at 22 and now living on a Florida property that has a runway, a hanger and even his own control tower. If you looked closely, you’d notice that Travolta almost always wears a Breitling — in movies like Broken Arrow (1996) and Wild Hogs (2007), to The Taking of Pelham 1 2 3 (2009) as well as endless red carpets and events since their 2009 partnership began. Let’s take a look at some of our favorites he’s promoted and worn over the years. The Navitimer is one of the brands most popular models since its introduction in 1952, and today, it’s one of Travolta’s favorites to wear. This watch is known for its insane precision — outfitted with a chronograph function and three concentric rings of markers around the face which gives pilots a timer, the ability to measure fuel consumption, and average out the speed. Inside, the in-house 47-jewel B01 movement (which was introduced back in 2009) ensures the automatic-winding chronograph with a a tri-compax layout runs perfectly. This watch also has a 70-hour power reserve and runs at a frequency of 28,800 vibrations. The look of this watch is purely aeronautical with a strong emphasis on the watches navigational and timing features that give it this intricate, handsome look. You’ll always recognize a Navitimer 01 by its sturdy steel 43mm case and black dial with that red second hand and that beautifully-complicated face and outer rings. 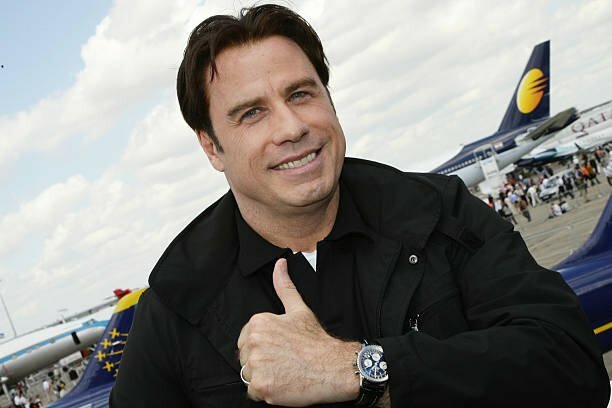 Travolta has famously appeared in Chronomat 44 ads alongside an airplane, but you can bet this isn’t all just for the cameras. 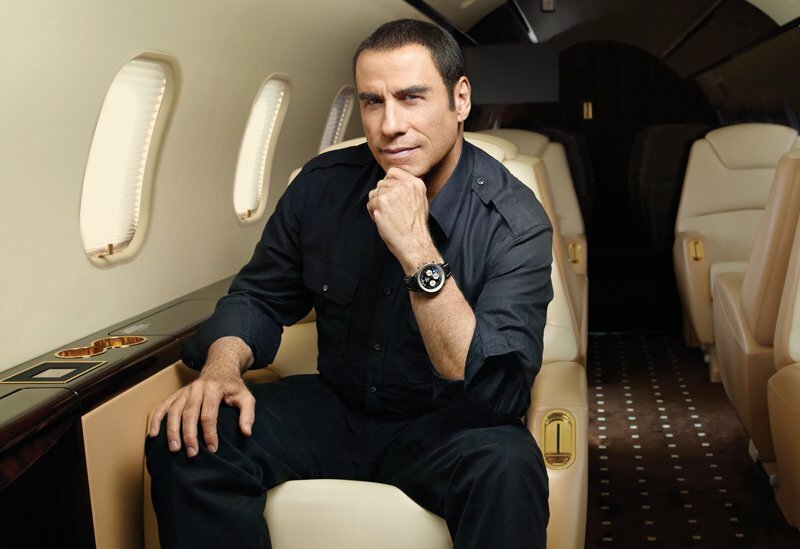 Travolta, like other pilots, clamor over the Chronomat 44 for its striking looks and rugged durability. The large 44mm case protects their in-house 47-jewel, self-winding Calibre 01 with a 70-hour power reserve. It can even withstand depths of 1650-feet, which makes it equally popular amongst divers. 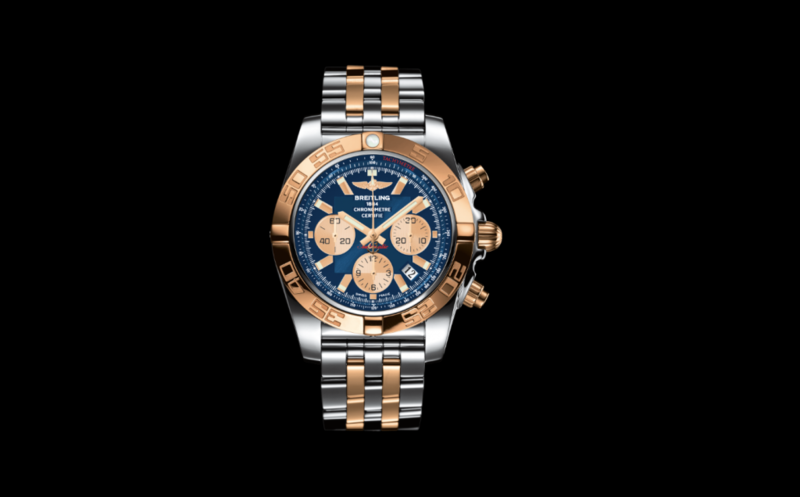 Breitling touts this watch as not only a pilots watch, but a true ‘sportsman’ watch that pushes boundaries. The stainless steel timepiece is also outfitted with scratch resistant sapphire crystal, a unidirectional rotating bezel, screw-locked crown, luminous hour, minute, and second markers, as well as tachymeter markings around the outer rim. In the ads, we’ve seen Travolta alongside the two-toned stainless steel and gold Chronomat 44, but we’ve also seen the movie star in the all-stainless model at Breitling events, too.